The idea of a truck that sets up shop in a certain area, serves its hungry patrons, then speeds off to address hunger elsewhere is familiar enough to most anyone. The years have been good to the food truck, and now it's delivered a lot of new value, bringing unexpected food choices to patrons everywhere. Michigan has plenty of food truck options, including some that are downright exotic. So find a comfy bench seat and get ready to enjoy some of the tastiest and craziest food truck fare in Michigan! So you woke up one morning with a craving for Trinidadian and it just won't die down. If you're anywhere near Detroit, there's great news ahead for you, because Norma G's specializes in Caribbean fare, including plenty of choices found from Trinidad. You'll be able to land such tasty and unexpected dishes as Curry Roti in both chicken and vegan options, Pelau in similar, and even some jerk chicken sliders. Wash it down with some sorrel-based beverage—a traditional standard of the Caribbean—and you're good to go. Said to be the only food truck operation in Kalamazoo—a claim some will readily debate—Gorilla Gourmet offers a slew of different food options covering a variety of regional options. Gorilla Gourmet offers not only tacos with an Asian flair, but also things like beef grinders and even quesadillas packed full of vegetables. If there's something you like, better get it while you can. The menu has been known to change pretty rapidly to help keep things fresh and interesting. One of the food trucks that will likely dispute Gorilla Gourmet's claims to being the only food truck in Kalamazoo, Schoolcraft vendor Lazy Man Bar-B-Que focuses on, much as the name implies, barbecue. More specifically, it has a slate of dishes involving beef brisket, as well as pulled pork and chicken breast items on hand. The real winner has to be the Lazy Man Sundae, which is not a dessert, and does not involve ice cream. This is a layer of baked beans, topped with pulled pork and then topped with summer coleslaw. Claiming to be the only full-time food truck in Grand Rapids, A Moveable Feast offers a wide array of options for those on the go. A Moveable Feast focuses on local produce and responsibly-raised animals to supply its meat and vegetables, which keeps the need for processed food to a minimum. Lest you think that means inedible hippie food, some of the most popular dishes on the menu include the shrimp & grits, the jalapeno popper grilled cheese, and the Grand Rapids Cheesesteak. Up in Holland to check out the windmills and suchlike? While you're there anyway, why not check out the Wood Truck BBQ food truck, a truck that's seemingly a sort of adjunct of the Beechwood Inn. After hiring its own Pit Master in 2010, who was regularly seen competing in Kansas City Barbecue Society events, Wood Truck BBQ started offering some of the best barbecue in Holland. Try out the pretzel sliders, the Asian pork taco, and some sesame broccoli slaw on the side. 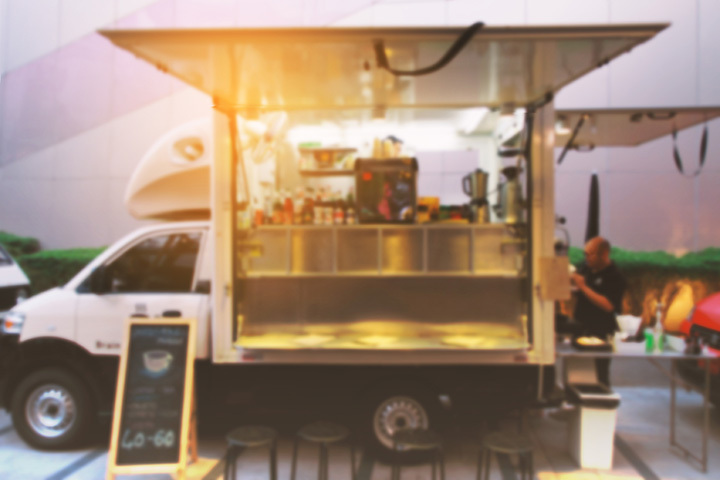 It’s all about The Little Fleet, which isn't just one food truck, but rather a set of food trucks that includes a rolling bar. A seasonal affair—food trucks don't always work great in a Michigan winter—the Little Fleet includes a huge variety of options from tacos to pizza and beyond to provide a host of different tastes throughout Traverse City. The name makes it pretty clear what kind of food is involved, but there will be plenty of variations on the theme to enjoy. The Carmen, for example, starts with pulled pork and queso fresco, but the Colleen goes to chicken, Chihuahua cheese and jicama slaw. We want to take this moment to thank Saginaw for allowing this to exist. Seriously, this is good for us all. Not for our waistlines or our cardiovascular systems, but good for our souls. Saginaw's Makin' Bacon is a food truck devoted wholly to the pursuit of bacon-based food items. Bacon is involved in pretty much everything, from the appetizers of bacon mac 'n' cheese to the main dishes of pulled pork sandwiches even to the desserts, where somehow, these brilliant souls have added bacon to the double chocolate chunk cookies. Breakfast, lunch, dinner and most every snack in between, Port Huron's Eli's Eats in the Streets delivers pretty much everything anyone could ask for, and all from a truck. Lest you think it's just a cleverly-named greasy spoon on wheels, Eli's is taking things to a whole new level. For instance, try the jalapeno sweet cornbread muffins or the grilled chicken with mango beer barbeque sauce. Reports also boast some exciting choices in kebabs with grilled asparagus as well. Now, to conclude our tour of Michigan food truck options, we come full circle and return to Detroit with Hero or Villain, a food truck that boasts some exciting combinations, depending on whether you're feeling virtuous and heroic or ready to be that nasty customer who wants the strangest and, let's face it, most exciting options. The menu changes routinely, and features different options with it. For instance, the Kingpin sandwich features chicken and mozzarella on sourdough, while the Captain Planet is a vegetarian option starting with sautéed portabella mushrooms. View more Michigan Food Truck Festivals and Events.